The U.S. Army Corps of Engineers and the Texas General Land Office have recommended a plan to shore up the Houston area and other parts of the Texas coast. It features a massive flood wall along Galveston Island and could cost as much as $31 billion. Following years of research, studies and public debate, the U.S. Army Corps of Engineers — in partnership with the state’s General Land Office — has recommended a multi-billion-dollar project that would protect the Houston area and its massive industrial complex from hurricane storm surge. The agencies had narrowed it down to four plans — one of them with an alternate variation — with varying configurations of levees, seawalls and locks. They also identified extensive “non-structural improvements” — such as beach renourishment and dune restoration — for much of the Texas coast. On Friday, they announced the selection of a plan that is most similar to a controversial proposal unveiled years ago by researchers at Texas A&M University at Galveston — initially dubbed the “Ike Dike” but often referred to now as the “coastal spine” — that was inspired by a Dutch flood protection system. 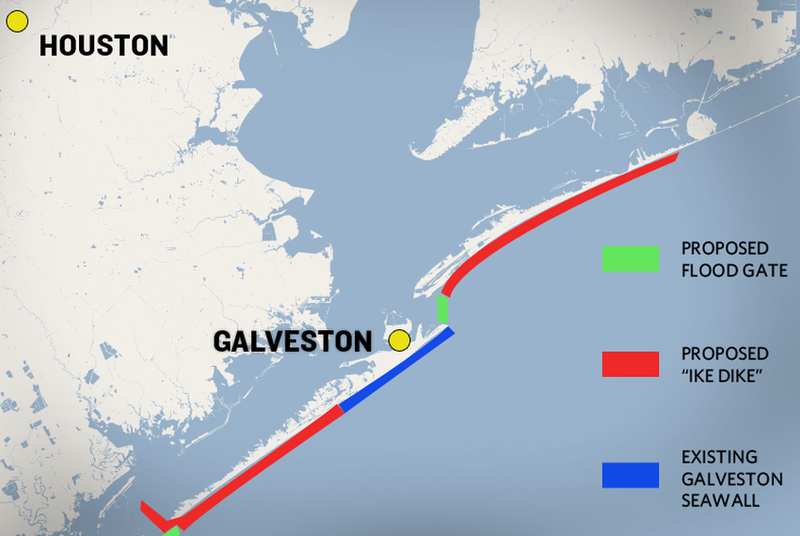 The sweeping plan calls for the construction of a levee along Galveston Island and the peninsula to its north, Bolivar, as well as the installation of a gate between the two isles to keep storm surge from pouring between them into Galveston Bay and the Port of Houston. It also includes improvements to Galveston's existing seawall and a “ring levee” around the heart of the city. Such a structure would protect the backside of the most densely populated area from surge and flood waters retreating to the Gulf of Mexico following a storm. Other plans that had called for constructing levees further inland had stirred up controversy among residents whose homes would be on the coastal side of the barrier. Combined with the recommended non-structural improvements — including 2.2 miles of dune and beach restoration along South Padre Island — the agencies estimate the plan would cost anywhere from $23 billion to $31 billion, according to a news release. An Army Corps project manager told the Tribune earlier this month that the coastal spine may cost as much as $17 billion, meaning it may make up slightly more than half the cost. "One storm can cost many lives and billions of dollars in damage, so the expense of doing nothing far outweighs the investment to protect and enhance our coast,” Texas Land Commissioner George P. Bush said in a statement. U.S. Army Corps of Engineers Galveston District Commander Col. Lars Zetterstrom noted in a statement that the plan “builds on the work of scientists, engineers and other experts” at A&M and Rice universities, as well as a quasi-governmental entity called the Gulf Coast Community Protection and Recovery District that had been formed to study the issue. The more than 200-year-old agency embarked on the largest study in its history in 2014 to determine how best to guard the Houston area and other coastal communities from devastating storm surge — larger even than the study that resulted in a $14 billion levee system in New Orleans built after Hurricane Katrina. The failure of the existing levee system during that storm has been linked to poor design by the Army Corps. Some academic engineers and environmental groups argue Texas doesn't need such a massive, ecologically impactful and expensive structure. Rice University researchers have said a gate to block storm surge from entering the Port of Houston — home to the nation’s largest refining and petrochemical complex — would suffice. Another looming question — and point of dispute — is who would be responsible for maintenance and operations and how much that would cost taxpayers. Bush, the land commissioner, said in an interview that he plans to push state legislation next year that would create a governmental entity to oversee a coastal spine. The public will have 75 days to submit public comments on the plan, in person or in writing. The agencies have scheduled six public meetings in late November and December in various coastal communities. Once a final project is settled on, it will be eligible for congressional funding — a phase with no deadline that many think could take years. A final recommendation is expected in 2021. Still, the plan has ginned up ample controversy. Some residents worry about how such a large scale project could impact their homes and properties. A coalition of local environmental groups has urged the agencies to more closely study potential ecological impacts and consider more natural alternatives. The push to protect the Houston area from storm surge through some kind of major infrastructure project has largely been driven by researchers at Rice and A&M who did extensive storm modeling after Hurricane Ike in 2008. While Ike was one of the most damaging storms in Texas history, they concluded it could have been much worse if it hadn’t shifted at the last minute. Storm models show that if a storm hit near the western end of Galveston Island, it would push a massive storm surge over and between Galveston and Bolivar and into Galveston Bay and the Port of Houston. In 2009, months after Ike, a researcher at Texas A&M University at Galveston, Bill Merrell, proposed the “Ike Dike” plan. Merrell said in an interview that a coast-front barrier is the best approach. But he said fine-tuning of the proposal may be necessary. Disclosure: Texas A&M University and Rice University have been financial supporters of The Texas Tribune, a nonprofit, nonpartisan news organization that is funded in part by donations from members, foundations and corporate sponsors. Financial supporters play no role in the Tribune's journalism. Find a complete list of them here.